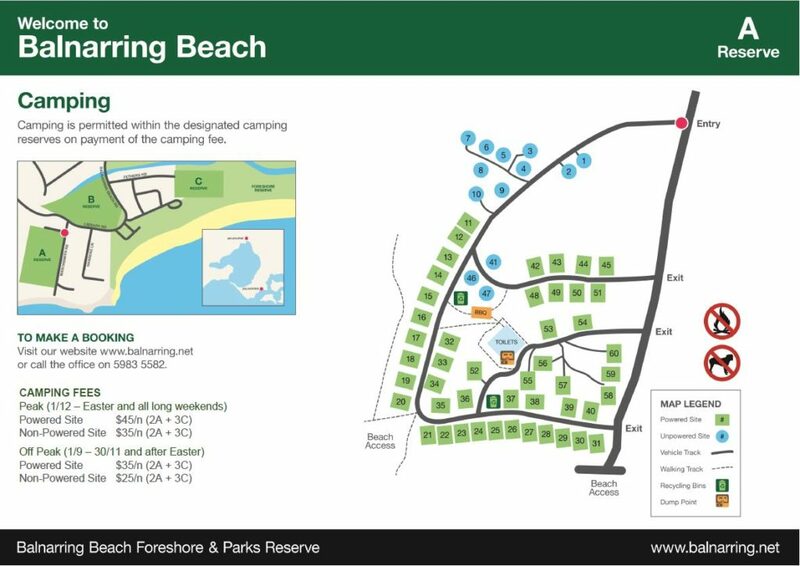 Balnarring Beach Foreshore Reserve has 3 campgrounds all set within a beautiful nature reserve. Each campground has its own amenity block with toilets, showers and laundry facilities as well as free BBQ’s. 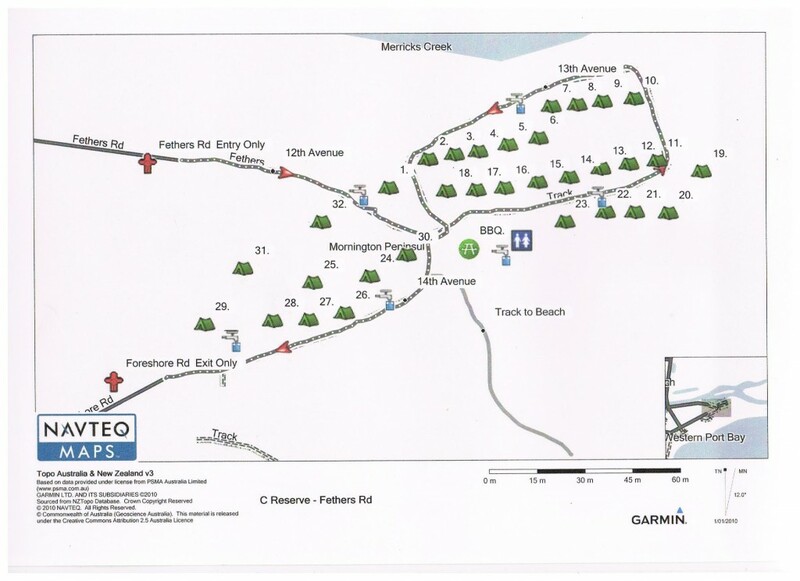 You can see the location of each camping ground here and maps of each camping ground are at the bottom of this page. There are no pets allowed in the camping reserves. A Reserve (open 1st Sept to Queens Birthday Long Weekend) has direct access to the beach. B reserve (open from Cup Day Weekend until Easter) has a small playground and is only a short stroll to the beach . C reserve (open from 26th December until the 31st January) is located by the Westernport Yacht Club and has direct access to the beach. Maps of the camping areas can be found at the bottom of this page. We are open from September 1st to the Queens Birthday long weekend each year. We recommend booking early as we are very popular, especially during holiday periods. We open reservations for each camping season on the 1st June each year. To check availability and book now using the link on the top right. We have a waitlist for sites over the summer holidays. Bookings over summer are for 7 days running from Saturday to Saturday. If you would like to join the waitlist please email the office with your name, telephone, group size and any preferences. We will address these requests on a first come first served basis. To make a booking click here. Alternatively you may either email or call our office on 5983 5582. To establish your reservation we need your residential address, mobile phone number, email address and the number of people that will be staying on the site. We require a non-refundable deposit of 1 x nights tariff to confirm your reservation and full payment 28 days prior to arrival. Payment may be made by credit card, cheque or EFT. Bookings will be confirmed upon receipt of your deposit and payment in full is required 28 days prior to arrival. We may rebook your site if full payment is not received. Cancellations up to 28 days prior to your reservation incur a 1 x nights tariff fee. There are no refunds for cancellations within 28 days of your reservation. 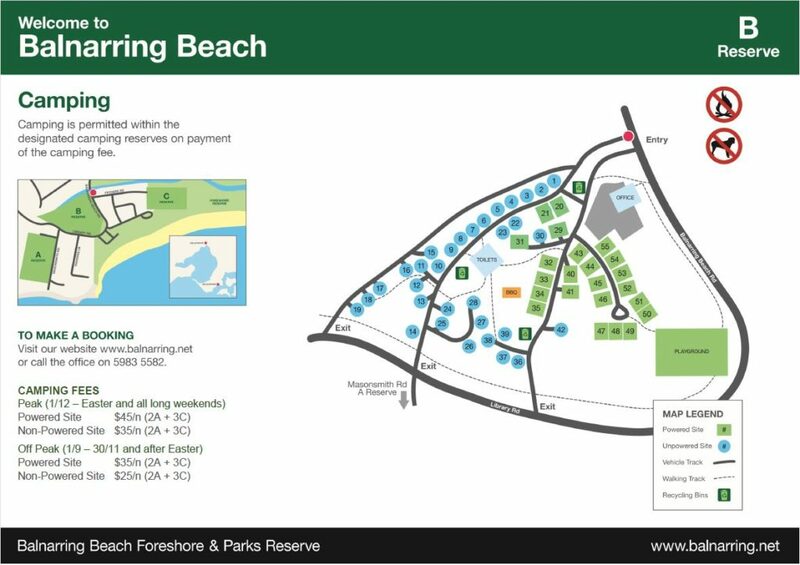 Balnarring Foreshore Parks and Reserve is situated within a nature reserve and has some special conditions including no pets, no fires (including coal BBQ’s) and only 1 vehicle per site. You may download our latest information for campers (pdf).